At the top of their gathering is the International Cryptozoology Museum. Cryptozoology is the study of hidden animals that remain unverified by science, like Yetis, Bigfoot, Mega mouth shark, mermaids or lake monsters. 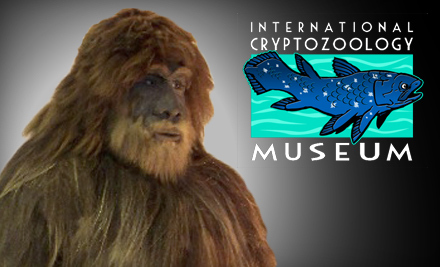 It is the only Cryptozoology museum and appeals to all ages. With its primary mission to educate, the museum has collected artifacts, hair samples and native art on yet-to-be-found animals. The museum was founded in 2003 by the author and cryptozoologist Loren Coleman. On Obscura Day, Saturday, May 31, 2015, the Museum will be one of the 80 sites worldwide tied into the day’s celebrations. For $10 each – for all visitors – a special concentration of videos and exhibitions will focus on the coelacanth and the movie it inspired, The Creature Of The Black Lagoon. 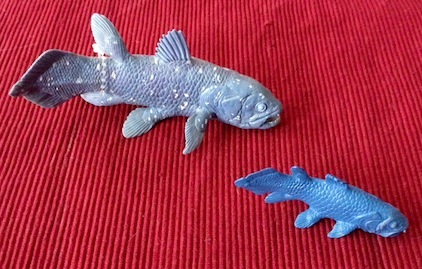 Every person admitted with a paid fee will receive a Safari replica of a coelacanth (the larger of the two shown above).